When it’s fresh berry season, I love to use them in recipes of all types but keeping the process simple allows you to shine the spotlight on the berry and enjoy the fruit in its purest form. Strawberries are abundant in the Carolinas during the month of May – the locally grown berries are available at every farmer’s market and up and down country roadsides. There are strawberry festivals in many small towns and everyone seems to be celebrating the season of that beautiful, sweet fruit. It is the first sign that summer is on its way and it’s time to lighten up our meals with beautiful farm fresh produce. There is nothing better than a simple strawberry compote or preserve that highlights the natural sweetness and keeps the berry juicy and flavorful. I am a crostini gal. A simple toast topped with good cheese and something homegrown paired with a glass of crisp wine is my go-to dinner. Today, these strawberry crostinis were my lunch and dinner (I couldn’t resist ;). This recipe calls for 2 pounds of fresh berries but I doubled the recipe and filled several jars with the beautiful, red goodness. My strawberry jars are going to be given as gifts, however, it’s always a good idea to store one away in the freezer for another day when you have the sweet strawberry cravings! After washing & trimming stems off strawberries, slice each one in half. Place the strawberries, fresh squeezed lemon juice, and honey into a large saucepan. Begin to cook on a stovetop on high heat until the berries reach a boil, then reduce to a simmer and stir occasionally until the juices are released and the berries soften. When the syrup of the berries coats the back of a spoon, turn off the heat and allow the berries to cool. Cook time is about 15-20 minutes or until the syrup is thickened. Pour the cooled preserves into a jar and refrigerate until ready to use. These strawberries are great on toast, waffles, crostini or spooned over different cheeses for an appetizer. Preheat the oven to 400° or set to broil (if you want them to toast very quickly). Slice a french baguette on the bias and place them onto a foil or parchment lined baking sheet. Brush each slice with olive oil, sprinkle with sea salt and place into the oven until they are lightly browned. If you have set the oven on broil, keep a close eye on the toasts because they brown quickly and can burn in no time - I am notorious for walking away and ruining a loaf of french bread so stay close to the oven! Remove and cool completely. These can be made the day before and stored in a ziplock baggie until ready to use. 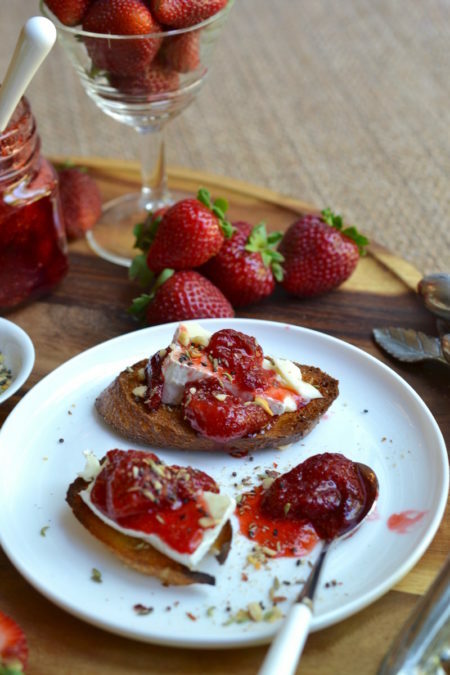 Place a slice of brie cheese (room temperature) onto the toasts, spoon with strawberry preserves (also room temperature) and sprinkle generously with Mumbai nut & spice mix. For garnish, top with fresh thyme leaves.